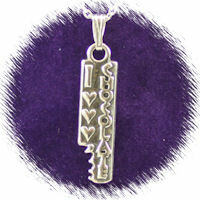 The "I Love Chocolate" necklace is an inscribed sterling silver pendant on a 925 silver chain. The pendant is 25mm high, 6mm wide, 2mm deep and 2.2g in weight. You can choose between different chain lengths. I like to think that the "I Love Chocolate" pendant is actually a bar of chocolate someone has started to eat. Why else is the corner missing?